This video describes using the IBM UrbanCode Deploy Plugin. Running complete test suites to validate a new build or deployment. Running a simple “smoke test” to check the success of a previous deployment step. 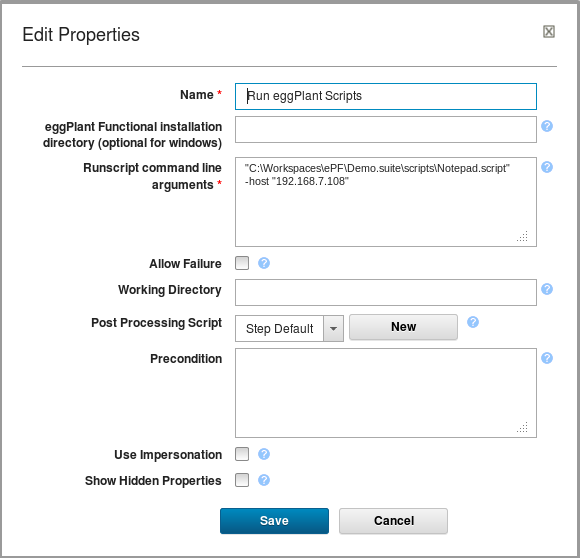 Running configuration or administration tasks that require automated GUI actions. Sometimes known as “Synthetic Transactions”. Deciding on the next step to take in the process as determined by a test requiring a GUI automation. A step for running one or more Eggplant Functional test scripts or a suite of tests by command line execution of the Eggplant Functional tool. Click here to read about running from the command line. A step for running a sequence of Eggplant Functional commands by sending them over the XML-RPC protocol to a remote Eggplant Functional instance using the Eggdrive mechanism. Click here to learn more about Eggdrive. Eggplant Functional version 14.11 or later must be installed and licensed. To run the step Run Eggplant Commands that uses Eggdrive, you must also have a Drive license. If using the step Run Eggplant Script, Eggplant Functional and the IBM UrbanCode Deploy Agent must be installed on the same machine. For using the step Run Eggplant Commands, Eggplant Functional can be running on any machine that the agent can connect to using the hostname or IP address and TCP port used when starting Eggplant Functional in Drive mode. The "Run Eggplant Commands" step has a dependency on the groovy-xmlrpc library and the agent will attempt to download this from org.codehaus.groovy if it is not available. If the agent cannot succeed then you will need to install this manually. You should always fully test and debug your scripts or commands by executing them in Eggplant Functional before attempting to run them using the plugin steps. For the Run Eggplant Scripts step you should first test command line execution using the Eggplant Functional runscript command with the required command line arguments and parameters. You can then copy the arguments into the the Step Properties dialogs, including any quote characters. 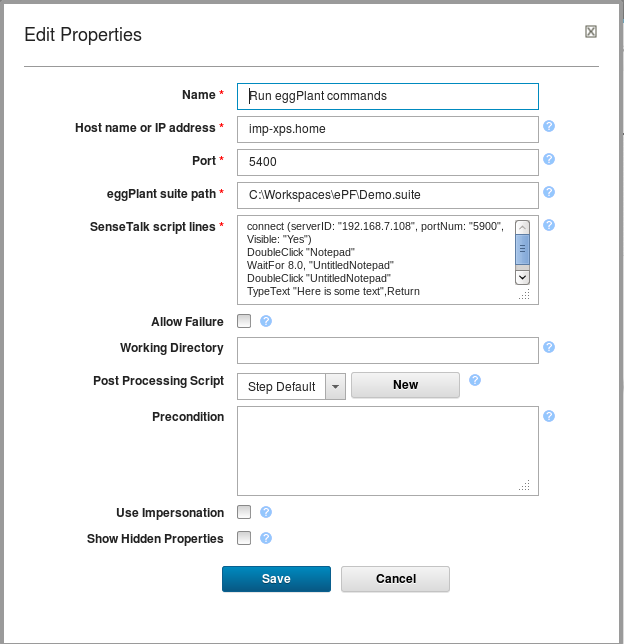 For the step Run Eggplant Commands, the plugin will run on any platform that supports the IBM UrbanCode Deploy Agent. For the step, Run Eggplant Script, the platform must also support Eggplant Functional. This includes Microsoft Windows, Apple Mac and Linux platforms. For details, see the Eggplant Functional release notes available from the Eggplant downloads page. Login as an administrator on the IBM UrbanCode Deploy web pages. Select the Settings Page, Automation Plugins, Load Plugin. Browse for the eggPlant.zip file and click the submit button. The plugin TestPlant Eggplant Functional will appear in the list of Plugins. In the Design for a process, from the Available Plugin Steps tree, select Functional Tests, then Eggplant Functional. On dragging a step into your design you are presented with the Edit Properties dialog for the step. Click the ? icon for help on each field. The following is additional information about Eggplant specific fields. Other fields are explained in the IBM UrbanCode documentation. Eggplant Functional Installation Directory: On Microsoft Windows the plugin code will look for the environment variables "ProgramFiles(x86)" and then "ProgramFiles" to find the Eggplant Functional installation folder and the file runscript.bat. If your installation is not under one of these locations you must enter the full path to the folder that contains the runscript.bat file. Runscript command line arguments: The complete set of parameters and options for the Eggplant Functional runscript command. Quote characters should be included around path names that include spaces. You can use newlines or spaces between arguments; newlines characters will be converted to spaces on execution. SenseTalk script lines: Each line is sent to Eggplant Functional as an Eggdrive execute("command") statement. You must first check that the lines operate correctly in Eggplant Functional. The Eggplant Functional output is displayed in the Output Log of the step execution. The Error Log does not display any output from Eggplant Functional. Ensure your scripts or commands work correctly using Eggplant Functional and from command line execution if using the step Run Eggplant Functional Scripts. Timeout error and "Connection Failed" error in the output Log on step: Run Eggplant Functional Commands. The IBM UrbanCode Agent requires internet access in order to install the library groovy-xmlrpc. Note that it only needs to install this once, so temporary access to the internet will be sufficient. “XMLRPCServerProxy error” in the output Log on step: Run Eggplant Commands. Check that Eggplant Functional is running with the correct argument and port. For example, runscript –driveMode 5400. Check the IBM UrbanCode Agent has access to the host or IP address of the machine where Eggplant Functional is running. Check there is no firewall blocking the connection on or between the IBM UrbanCode Agent and Eggplant Functional machines.